Manipulating physical objects like a classic shape sorter and counting blocks is essential to early childhood development. But, in today’s digital world, toddlers are spending more time than ever on electronic devices. 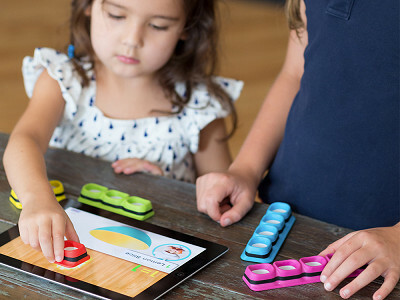 A learning company called Tiggly is bridging the gap between tablets and tactile toys. At first glance, Tiggly’s shapes look like parts of any other brightly colored childhood game. But, the soft plastic pieces have silicone touch points designed to interact with Tiggly apps on your iPad or iPad Mini. The shapes for both Tiggly Shapes and Tiggly Counts come in a handy little pouch complete with unlimited access to several apps designed for children ages 18 months to about 5 years that create scenes and stories from their imagination and help build shape, number and even animal recognition. Tiggly was co-founded by Phyl Georgiou (Founder & CEO), Bart Clareman (Co-Founder & COO), and Azi Jamalian (Co-Founder & Chief Learning Officer). Phyl & Bart are graduates of Harvard Business School, and Azi is a PhD candidate in childhood development at Columbia University. One part digital, one part tactile—Tiggly is updating classic hands-on learning toys by combining them with handheld iPad games. Hi everyone -- Tiggly brings the educational benefits of physical play to the iPad. Into these shapes, we've incorporated more than 70 years of academic research that shows how physical play is a critical component of early cognitive development. Please let me know if you have questions about it. Hi Bart! This looks like such a great gift for my nieces and nephew! What tablets do the shapes work with? @Jenny Thanks Jenny! Tiggly Shapes work with all generation iPads and iPad minis, so there's no need to worry if your nieces and nephew are using older hardware. @Bart Cool. What about Android? @Jenny Our goal is to bring the interactivity and educational benefits of Tiggly Shapes to tablet users wherever they are, whether on iOS (Apple), Android, or Windows devices. We've started with Apple devices, and Android will follow soon in the months ahead. Stay tuned! Hey Bart! This is great. Something interactive is such a plus rather than just letting children watch youtube! Just bought it for our 2 year old and best of luck! @Joseph Thanks Joe! Making toddlers' experiences with the iPad as interactive and educational as possible is what we're all about. We really appreciate your support! This looks great for two of our grandsons. How do we get the APPS that work with the shape toys? If you get stuck at any point, a handy place to look for additional info is http://tiggly.com/install. Bart, Tiggly looks amazing! However, 18 months to 4 years crosses over a lot of developmental milestones. Can you elaborate on how a child 3-4 years of age would interact with Tiggly? @Guest This is a really important question, thanks for asking it. You're absolutely right -- the developmental levels of 3-4 year olds are very different from 18 month olds. Watching kids of different ages use the apps is fascinating. We've tested the product with over 100 children and we've iterated constantly in order to ensure that children across the range we set learn and have fun with Tiggly. Our apps offer different learnings to children of different developmental levels. For example, in Tiggly Stamp, 3-4 year olds can conceive of, tell and record elaborate stories about the funny animals and objects they create with their shapes, whereas a 2 year old with a more limited vocabulary would likely benefit more from the object creation process. Similarly, in Tiggly Draw, older users are able to draw more intricate pictures while younger children tend to draw less sophisticated portraits. In Tiggly Safari, younger users are challenged by the game earlier in the experience than 3-4 year olds, who are in turn challenged more by later stages of the game when matching shapes becomes not just a matter of spatial recognition but also hand-eye coordination. Hi Bart... What a terrific idea for kids and tablets. My Granddaughter (19 mos) uses and enjoys playing games on her mom's Ipad - but I've always felt that there needed to be more opportunities for variation/creativity in the "play." Tiggly does that and more. Thanks I can't wait until my Granddaughter opens hers Christmas morning!!! @Pamela Thanks so much Pamela -- we can't wait for your granddaughter to unwrap her set of Tiggly Shapes either! From all of us at Tiggly, all the best to you and your family over the holidays! I think this could be a great gift for my grand neice/nephews. Are the ipad APPS free for the users? 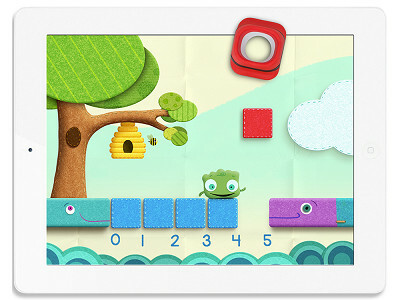 @Guest Thanks for your question -- yes, each purchase of Tiggly Shapes comes with three free iPad apps! Bart, I've heard of great apps for kids on iPads but hesitated to buy one as my son is blind and obviously benefits from tactile objects. This looks great for visually impaired children. I would love to see more developed that the blind could benefit from. What's next for you guys? @Tina Thanks Tina, I'm so glad to hear our product can be helpful for the visually impaired! The future is very exciting for us! We have several apps in the works for Tiggly Shapes that we'll launch in the coming months (the first one is due by December 1), and then in February we'll debut new physical products as well. We need to stay tight-lipped about those new physical products for the time being, but we're very excited about them and we can't wait to share them with children (and their parents). Stay tuned! Manipulating physical objects like a classic shape sorter and counting blocks is essential to early childhood development. But, in today’s digital world, toddlers are spending more time than ever on electronic devices. 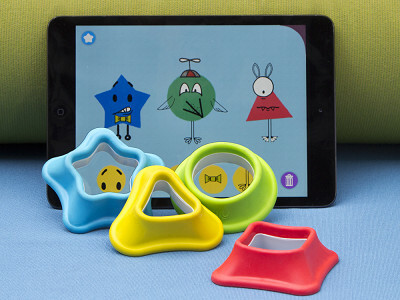 A learning company called Tiggly is bridging the gap between tablets and tactile toys. At first glance, Tiggly’s shapes look like parts of any other brightly colored childhood game. But, the soft plastic pieces have silicone touch points designed to interact with Tiggly apps on your iPad or iPad Mini. The shapes for both Tiggly Shapes and Tiggly Counts come in a handy little pouch complete with unlimited access to several apps designed for children ages 18 months to about 5 years that create scenes and stories from their imagination and help build shape, number and even animal recognition. Tiggly was co-founded by Phyl Georgiou (Founder & CEO), Bart Clareman (Co-Founder & COO), and Azi Jamalian (Co-Founder & Chief Learning Officer). Phyl & Bart are graduates of Harvard Business School, and Azi is a PhD candidate in childhood development at Columbia University.